humimeter FS4 is a grain moisture meter and can be calibrated by the user for cereal end products. For use in farming, trade, seed growing, research, laboratories, and the food and animal feed industries. 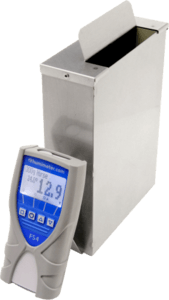 Whole grain meter with 300g sample weight and sample temperature measurement. For use in farming, trade, seed growing, research, laboratories, and the food and animal feed industries.